Gatwick Airport has set out a controversial vision for its future with the publication of a new draft master plan. Among the options on the table is the routine use of the current standby runway, a suggestion which has angered local residents and environmental campaigners. However, this is just one of three options open Gatwick said. The draft master plan is being announced to the airport’s independent consultative committee GATCOM which meets today. The publication reflects department for transport guidance for airports to provide regular updates on their long-term plans and responds to a recent call for airports to ‘make best use of their existing runways’. In the near term, the airport has considered how deploying new technology could increase the capacity of the main runway, offering incremental growth through more efficient operations. Gatwick has successfully utilised its runway to unlock growth in recent years and remains the world’s most efficient single runway. The use of the latest technology could provide more opportunities for the future. 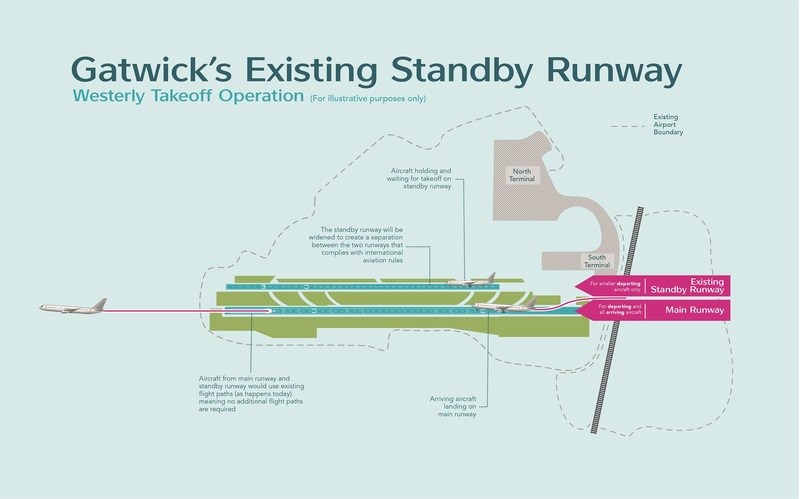 Under its current planning agreement, Gatwick’s existing standby runway is only used when the main runway is closed for maintenance or emergencies. However, the 40-year planning agreement will come to an end in 2019. The draft master plan sets out for the first time how Gatwick could potentially bring its existing standby runway into routine use for departing flights, alongside its main runway, by the mid-2020s. This development, which would meet all international safety requirements, would be delivered without increasing the airport’s noise footprint and provide greater operational resilience, Gatwick said. Should the airport decide to further progress the use of the existing standby runway, it would submit a detailed planning proposal and follow a Development Consent Order process, which would include a full public consultation. Finally, while Gatwick is not currently actively pursuing the option of building a brand-new runway to the south of the airport - as it did through the Airports Commission process - Gatwick believes it is in the national interest to continue to safeguard this land for the future as part of its draft master plan. The airport is now keen to encourage responses to a 12-week public consultation it has launched today to gather feedback and views on the draft master plan. All responses will be reviewed before a final version of the master plan is agreed early next year. Stewart Wingate, chief executive, London Gatwick said: “Our draft master plan marks the start of a new phase for Gatwick – building on what has made the airport the success it is today, and pioneering again to take advantage of the exciting opportunities that lie ahead. “As the UK heads towards an important new chapter, Gatwick’s growing global connections are needed more than ever but this must be achieved in the most sustainable way. “From using new technologies on our main runway, to the innovative proposal to bring our existing standby runway into routine use, our draft master plan offers agile, productive and low-impact ways of unlocking much-needed new capacity and increased resilience from within our existing infrastructure. “Gatwick’s growth has been built through partnership so as we look ahead at our future development, we want to shape these plans together with our local communities, our passengers, our airlines and partners. “We would encourage as many people as possible to take part in our consultation process.